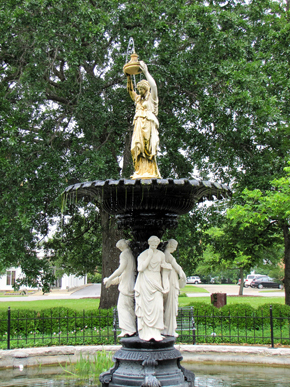 This cast-iron and marble fountain, which dates to 1895, graces the center of Demopolis's historic Public Square. The town's centerpiece was created in 1819 soon after the first settlers of the Vine and Olive Colony arrived in the area. Several historic structures, including City Hall, bound the park. Photo courtesy of Billy Milstead, Thomasville, Alabama.